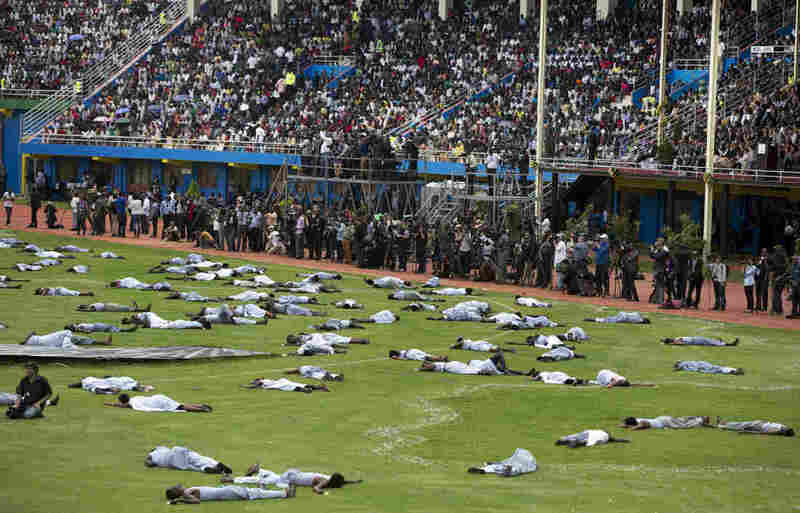 Rwanda Honors Dead, Celebrates Progress, 20 Years After Genocide : Parallels The brutality that began in Rwanda in April 1994 left 800,000 dead in just over three months. Some collapsed in grief as the country marked the anniversary of those dark days. 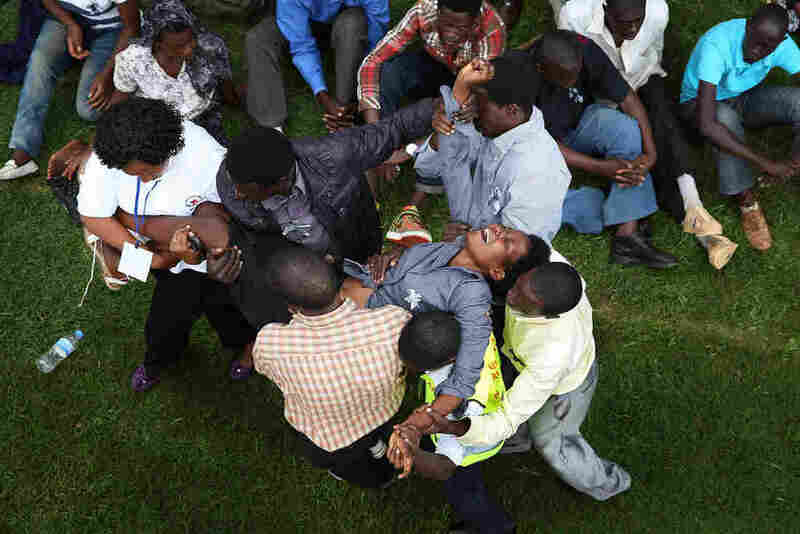 A distraught woman is carried out of Amahoro stadium in Kigali, Rwanda, on Monday during the 20th anniversary commemoration of the country's devastating 1994 genocide. After a minute of silence at noon, Monday's remembrance of the 20th anniversary of the Rwandan genocide began with testimony from a survivor. The screaming started soon after. In the crowd of 30,000 gathered in Amahoro stadium in Kigali, the Rwandan capital, first this person then that began to wail and thrash. Men in yellow vests took them to a special room of mattresses in the stadium basement. In general, Rwandan culture discourages such outward displays of grief. But not during this time of year, when traumatic flashbacks are common. Performers re-enact the events of the genocide at Amahoro stadium on Monday. Ethnic tension between the majority Hutus and minority Tutsis erupted in 100 days of brutality. The Rwandan genocide was a murderous campaign of majority Hutus against minority Tutsis, triggered by the killing of the Hutu president but planned with racist ideology for years before. It began on April 7, 1994, and ended three months later with more than 800,000 people killed, the fastest genocide in history. Monday's commemoration honored the dead. But it was also a celebration of how far Rwanda has come. Two decades later, more than half the country's population was born after the fact. Much of Monday's event was educational. A historical re-enactment depicted the arrival of Belgian colonialists in the early 20th century. The colonialists were played by eight Russian soldiers stationed in Kigali — the only white actors in a cast of 800. They measure the Africans' noses and impose a racial hierarchy on what had merely been social distinctions: Hutu and Tutsi. And that, says one of the play's narrators, sowed the seeds of genocide. "Dehumanization started, and humans became objects," the actor said. 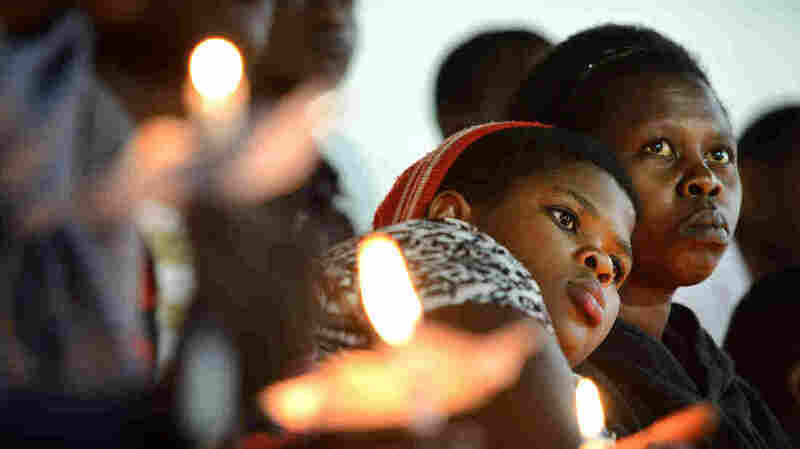 Rwandan women hold candles during a night vigil and prayer for genocide victims at Amahoro stadium. When the killing starts, the colonialists trade their safari hats for the blue berets of U.N. peacekeepers and drive off through the fallen and falling bodies. It's a re-enactment of the quite literal abandonment of Rwandans in 1994 by the U.N. Then the Rwandan Tutsi army jogs in. The crowd cheers these trim young men in camouflage uniforms, who tenderly lift each prostrate body until the soccer field is clear. 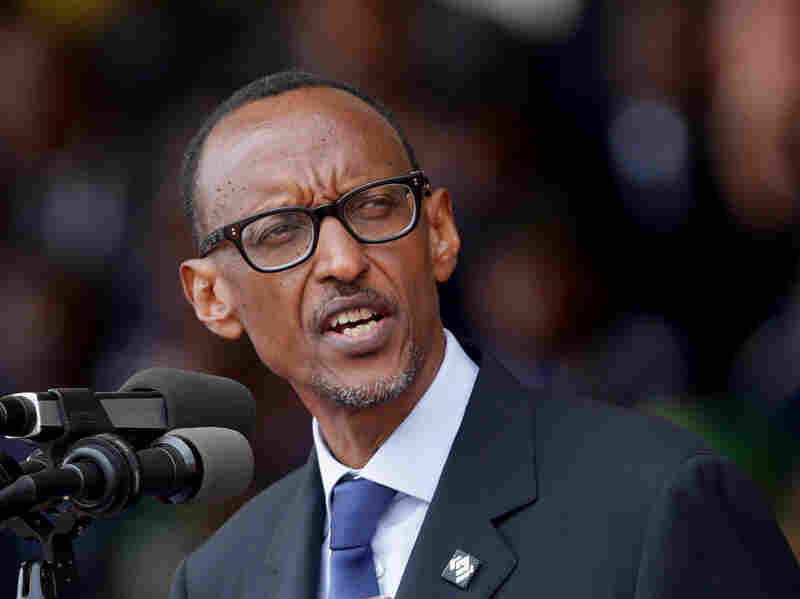 Rwandan President Paul Kagame, the former leader of that army, asked the crowd not only not to forget their abandonment by the U.N., but to imagine what would have happened if the U.N. had given more help. "It is not hard to imagine how we could have ended up," he told the crowd. "We could have become a permanent U.N. protectorate with little hope of ever recovering our nationhood." Rwandan President Paul Kagame exhorted the crowd gathered in Amahoro to remember not only the U.N. abandonment, but how Rwanda could have ended up. "We could have become a permanent U.N. protectorate with little hope of ever recovering our nationhood," he said. He described an archetypal failed state fatally dependent on international goodwill, divided and engulfed in never-ending civil war. "With endless streams of refugees, with our children sick and uneducated," Kagame said. "But we did not end up like this." Kagame has always relished the role of spoiler to Europe's self-regard. He alluded to the absence of the French foreign minister at the ceremony, who pulled out after Kagame accused France of having a direct role in the genocide. France admits only to providing weapons and training used by the genociders. But no country is powerful enough to change the facts, Kagame said. His rejoinder — the Rwandan president's only French phrase of the day — got the biggest applause. "Les faits sont tetus," he said to huge applause. A 27-year-old orphan named Claude stood outside the stadium. He asked that his voice not be recorded. He shrugged off the diplomatic kerfuffle with France, and said he had spent the remembrance thinking of his parents and brother. When asked to describe his emotions, he answered: honor — and sadness.